Ikea Organizes Your Computer Desktop. This actually launched a few weeks back, but I haven’t been to the Ikea site for a while so I just discovered it today. Ikea Working with interactive agency Laboratory Ideas in Budapest has developed a virtual desktop based on the popular shelving system EXPEDIT that is designed to help you organize your virtual desktop in addition to the physical space in your life. 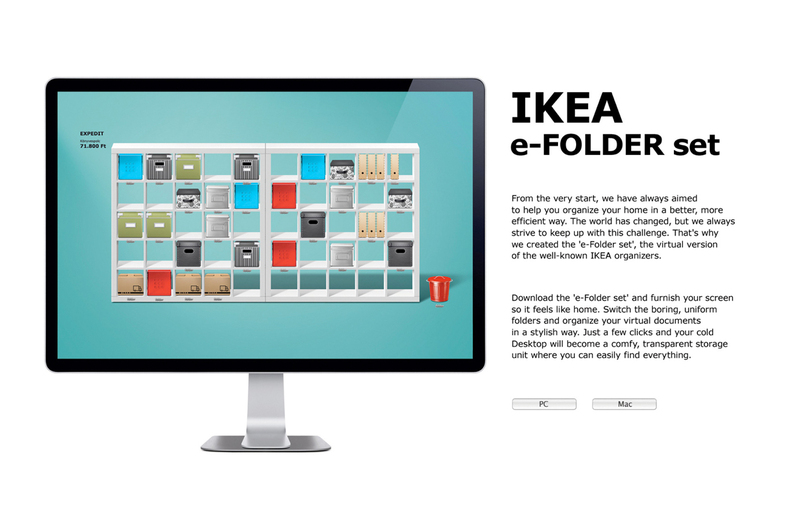 The E-Folder organizer tasks decorative IKEA storage bins with acting as desktop folders on the shelves of the popular bookcase. Posted in Advertising, Technology and tagged Budapest, Czech Republic, EXPEDIT, Hungary, IKEA, IKEA e-Folder, Laboratory Ideas, postaday 2011, postaday2011, Slovakia on March 14, 2011 by Author.